From sophisticated patterns to colorful solids our carpet styles come in a full rainbow of shades, tones and hues. We offer the finest carpet brands and have the widest selections of designer colors, patterns and textures that will make your job of finding the perfect carpet easier and more enjoyable. Today's carpet fibers and pads enable people with pets and small children to enjoy the look and feel of carpet without worry. We also offer a fine selection of area rugs. Area rugs are the perfect and easy way to change the look and feel of a room. You can celebrate the season, decorate for the holidays, add a touch of sophistication or a warm cozy feel. In fact, area rugs are so versatile, many designers are using them on top of carpet to make a statement. The professionally trained sales staff at Wholesale Flooring Center, your Coconut Creek FL carpet store, can help you find the right carpet fashion or area rug for any room in your home. The most frequently used carpet fiber, highly desirable due to its exceptional durability, versatility, and reasonable pricing. It can be dyed in an endless variety of colors and made into numerous styles and textures. Nylon is commonly used in residential and commercial applications. Used in residential and a few commercial applications, polyester has good color clarity, colorfastness, and resistance to water-soluble stains. All of Mohawk's staple polyester yarn comes from our state-of-the-art plastic bottle recycling facility. This "food-grade" PET Polyester fiber might be considered to be better quality than "carpet-grade" polyester fiber. Also known as Olefin, this fiber resists fading, generates low levels of static electricity, is favorably priced, and can be engineered in outdoor applications. Due to its manufacturing process, polypropylene inherently resists stains. 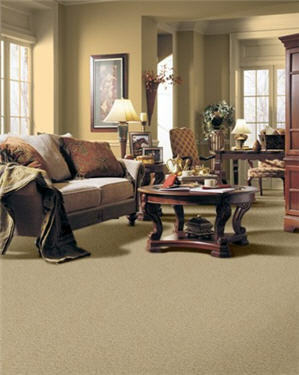 When used in specific carpet constructions, this yarn will perform as well as most resilient fibers. The most expensive of the fibers listed here, it is a natural fiber with moderate soil and stain resistance. Durable, luxurious "hand", reduced visible soil due to fine, light-scattering characteristics.